Insurance Services - Keating & Associates, Inc.
Small business owners know the value of retaining every employee. However, the contributions of a select few might be especially critical to the company’s well-being. Benefits offerings for these invaluable individuals can help you not only attract but retain them. 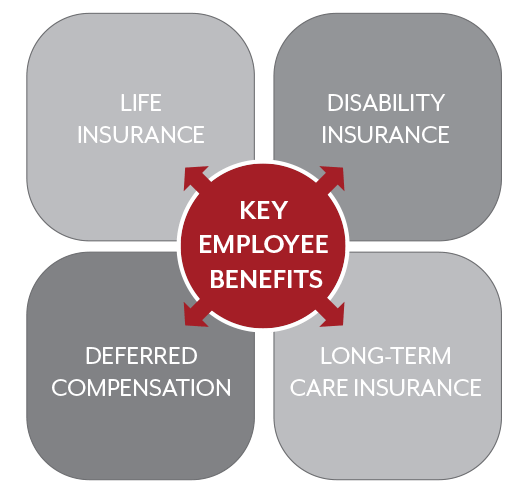 We are here to help tailor key employee benefit plans that work for them, and for your business. We have the benefit of experience in these areas here at Keating and Associates, as well as the ability to be innovative and creative when seeking a solution for you. Let us help position your business for a confident future. One of the most flexible employee benefits — long-term care insurance — can be offered to a select group of your employees allowing you, in some cases, to deduct the entire cost of the premium. By providing financial assistance to fund expenses for assisted living, nursing care or home healthcare, this benefit can help protect against the need to use the employee’s assets – funds which may be depleted by the cost of healthcare when faced with a chronic health condition. Insurance services may be offered through Keating and Associates, Inc. or Raymond James.